On 2nd day in Srinagar, the all-powerful GST Council headed by the Hon’ble Finance Minister, Mr. Arun Jaitley met for the fourteenth time with an agenda to finalise the tax rate fitment of services. This meeting is paving the way for India to join select League of Nations with a GST rollout from July 1, 2017 as envisaged. The GST Council has broadly approved the GST rates for services at Nil, 5%, 12%, 18% and 28% for services including telecom, insurance, hotels and restaurants. The information has been uploaded immediately after the GST Council’s decision and it will be subject to further vetting during which the list may undergo some changes. It is stated that the decisions of the GST Council are being communicated for general information and will be given effect through gazette notifications which shall have force of law. services provided by a goods transport agency, by way of transport in a goods carriage of agricultural produce etc. Services provided by way of pure labour contracts of construction, erection, commissioning, installation, completion, fitting out, repair, maintenance, renovation, or alteration of a civil structure or any other original works pertaining to the Beneficiary-led individual house construction / enhancement under the Housing for All (Urban) Mission/Pradhan Mantri Awas Yojana (PMAY) etc. (ii) 5% Rate: Category of services falling under the slab of 5% shall be subject to condition pertaining to availability of Cenvat credit such as transport of goods by rail/ in vessel, transport of passenger by rail (other than sleeper class)/ air (in economy class), services of goods transport agency, renting of motor cab, Selling of space for advertisement in print media etc. (iii) 12% Rate: Category of services falling under the slab of 12% shall be subject to condition pertaining to availability of Cenvat credit such as transport of goods in containers by rail by any person other than Indian Railways, construction of a complex, building, civil structure or a part thereof, intended for sale to a buyer, wholly or partly provided the value of land is included in the amount charged from the service recipient [With full Input Tax Credit (“ITC”) but no refund of overflow of ITC] etc. (iv) 18% Rate: Category of services falling under the slab of 18% shall be subject to condition pertaining to availability of Cenvat credit such as supply of food/drinks in outdoor catering, composite supply of Works contract [With full ITC], telecoms & financial services etc. Further, it may be noted that all other services not specified elsewhere will also fall under the slab of 18% with full availability of ITC. 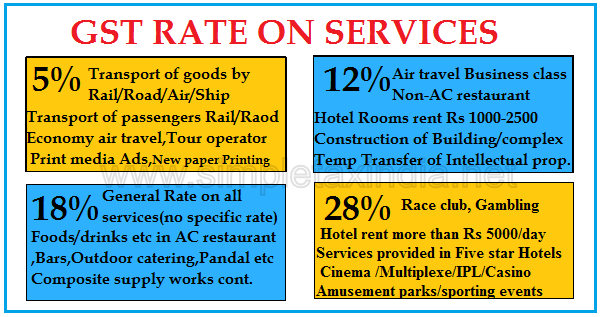 (v) 28% Rate: Services by way of admission to entertainment events or access to amusement facilities etc., Gambling, supply of food/drinks in air-conditioned restaurant in 5-star or above rated Hotel etc., will attract highest rate of tax i.e. 28%. Twelve list of services that will be under reverse charge has been approved by the GST Council such as goods transport agency services, services by an individual advocate or firm of advocates by way of legal services, directly or indirectly, services by a director of a company or a body corporate, import of services, radio taxi or passenger transport services provided through electronic commerce operator etc. The information has been uploaded immediately after the GST Council’s decision and it will be subject to further vetting during which the list may undergo some changes. Further, it is stated that the decisions of the GST Council are being communicated for general information and will be given effect to through gazette notifications which shall have force of law. The GST Council has also decided that e-commerce players such as Flipkart, Snapdeal are required to deduct TCS @1%. All these series of events are going to enlighten the pave for rolling out of the biggest indirect tax reform from July 1, 2017.